Whether it's binge-watching box-sets, shopping for clothes, chatting to friends or picking up work emails, staying connected is pretty much essential to everyday life. And now if you're flying Virgin Atlantic you'll be able to keep busy or kick back when up in the sky thanks to the airline's decision to roll out Wi-Fi across its entire fleet of 39 aircraft. So when you're flying between the UK and the US, Caribbean, Africa, Asia and the Middle East you'll be able to get online. Virgin says it's the first airline in Europe to offer Wi-Fi on all services - a year ahead of competitors - and it is holding a series of events in the sky to celebrate it. Passengers will be able to get online for as little as £2.99. They can connect once the aircraft they're flying on reaches 10,000 feet - this means they'll be online soon after take-off. And with a Wi-Fi Max package designed to last the whole flight, they can stay connected 'til shortly before landing. But don't leave arranging travel insurance 'til you're at 10,000 feet - get that sorted while both feet are firmly on the ground. 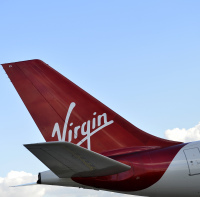 Mark Anderson, an executive vice president at the airline, said: "Customers flying around the world with Virgin Atlantic can work and play throughout their flight as we become the first airline in Europe to offer a fully Wi-Fi enabled fleet. "Innovation has always been in our blood and we've worked closely with Wi-Fi providers to develop the fastest, most reliable connection across the Atlantic, and are the first carrier to offer Wi-Fi between the UK and the Caribbean, China and Africa."